My boyfriend is a huge music fan and this was the perfect birthday present! The tour guide, Bobby Pin, is so knowledgeable and presents his extensive facts and information in such a fun way! As a native New Yorker, it was such an amazing experience in my own backyard! Highly, highly recommend! We were a group of four men of a certain age on vacation from Edinburgh. We all have an interest in the music of the era and all greatly enjoyed this very informative tour. A wealth of stories, well told and supported with contemporary memorabilia. Highly recommended. And buy the book! This was a really great tour by a cool guide who really knew his music. Thoroughly recommended. Absolutely brilliant! Highlight of our NYC trip. This tour was informative, entertaining and a really nice walk through the East Village and through time. A must if you are a music fan and particularly a fan of 70s NY punk. The tour guide was easy to find and a really nice guy. Very knowledgeable. I'd be happy to recommend it to anyone. Highly recommend this tour. Bobby Pinn was our guide and he was exceptional. You can see the various sights on your own, but with Bobby as the guide you get the historical perspective and great stories also recommend purchasing Bobby's book which is for sale at the end of the tour. This tour covers it all, Rock, Jazz, Glam and Punk. East Village is also a great place to hang out after the tour. A great overall experience. Larry, our guide, was so knowledgable. He gave an in depth music tour, he is a great source of information. Another added benefit of the tour is that you really get to know an area of New York city that is beautiful. I saw streets I would have never seen on my own. Great time!!!! 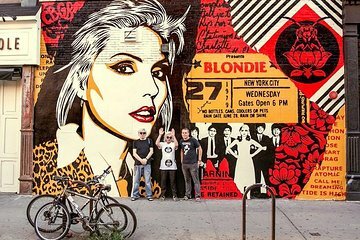 A fun and informative way to see many of New York's rock n roll landmarks that are hiding in plain sight. Especially enjoyed seeing the old Fillmore East as well as the building used for Physical Graffiti and Waiting on a Friend. Highly recommend the Rock 'n' Roll walking tour,of the East Village,Bobby Pinn was very knowledgable taking us to some iconic sites with some great stories. Fantastic! Many thanks to Larry who really brought the Village to life and gave the three of us an unforgettable experience. Fans of Bob Dylan in particular will enjoy this tour as Larry's knowledge is encyclopedic and he is a gifted raconteur as you weave through the streets of Greenwich. Standing right where the cover photo for Freewheeling was shot will stay with me for a long time! If you have a couple of hours to spend on a Sunday morning and you enjoy the music of the 60s this is a tour you should certainly consider. Recommended!